Feline crafty? Our new video series features step-by-step guides on how to create your own homemade cat treats and toys, from cosy cat beds to DIY scratching posts. The first video in the series shows you how to make a cat tent for your feline friend using a t-shirt, box and cosy cat bedding. 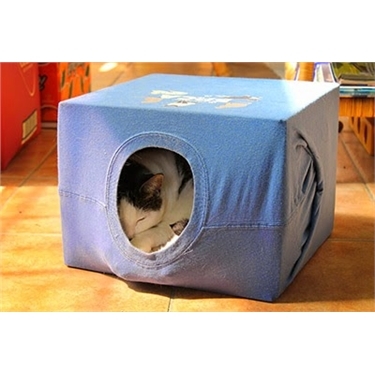 Not only is a cat tent easy to make – it offers your cat the ideal place to curl up in and hide. Cats like to have plenty of spaces around the home to hide as it helps them feel safe and secure, especially if they’re feeling particularly anxious. You can subscribe to our Youtube channel by clicking here.